This past weekend was the 2nd annual pig roast that I host with the amazing @mikeypiro. We had such a great time last year, so we decided to go bigger and better this time around. As I have written about on numerous occasions, I am a HUGE believer in brining giving the meat a long salty / flavorful bath), especially when something is going to be cooked over high heat. I brine pork chops, chicken, pork tenderloin, turkey, and even beef brisket (to make corned beef). Last year we brined our smallish (35lb) pig before our roast, so I figured that we should do it again this year. Since the theme of this year was “bigger and better” than last year, our pig was about 15lbs heavier. This posed a few logistical issues. How long do I brine the beast? How does one going about making enough brine for such a plump porcine pal? Well, here is how it went. First, I did a little research on the porkanet. For those of you unfamiliar with this, there is a secret internet used by only pig fanatics. I would tell you where to find it, but then I’d have to kill you (and stick an apple in your mouth). From my research, I determined that it would probably take a good 48 hours, fully submerged, for this little piggy to take to the brine. All well and good, but where do I give the piggy this delicious bath? I was fairly certain that Mrs. Notafoodie would not take kind to coming home to a pig carcass in the family tub, not to mention what my 3 year old son would have said. Luckily @mikeypiro had a 100 gallon cooler that he could spare. The porker barely fit in to his new temporary home, but with a little force, I was able to get it in the cooler. Side note: If this pig roast gets any bigger, we’re going to need a bigger cooler! So, I had time and place all set, but what luxurious concoction would piggy be submerged in for 2 days? Since this was a fall pig roast, I decided to make an apple cider brine. I also decided that sage would be a perfect compliment to the apple, and that there should be a ton of garlic as well (since everything is better with garlic). Why do they always smile? I eyeballed the cooler to determine the volume and decided that I would buy 5 gallons of cider and start there. My methodology for making the brine made me appreciate the math classes that I was forced to take in high school, but the real heavy math work was done by the great Michael Ruhlman’s “Ratio” app. I use this app a few times a week, and I think it’s the greatest cooking tool I have. The app stated that a good brine should be 20 parts liquid to every one part salt. I dumped my 5 gallons of cider directly on to the pig, and eyeballed that probably need another 3 gallons of liquid to cover “The Notorious P.I.G” (one of the many nicknames we had for the beast). Using the ratio app, I figured out that for a total of 8 gallons, I needed 1.5 kilos of salt. Since 5 gallons of liquid were already in the cooler (assuming the pig wasn’t thirsty), I took my garlic, sage, some peppercorns, a few bay leaves, and my 1.5 kilos of salt, and made a nice little soup on the stove. I heated my concoction until the salt had mostly dissolved, let it cool, and then added it to the cooler. It is EXTREMELY important that the brine be cool before submerging any meat in to it. Warm water and meat are a breeding ground for all sorts of grossness. That’s why I’m not a big fan of the public jacuzzi. Ewww. 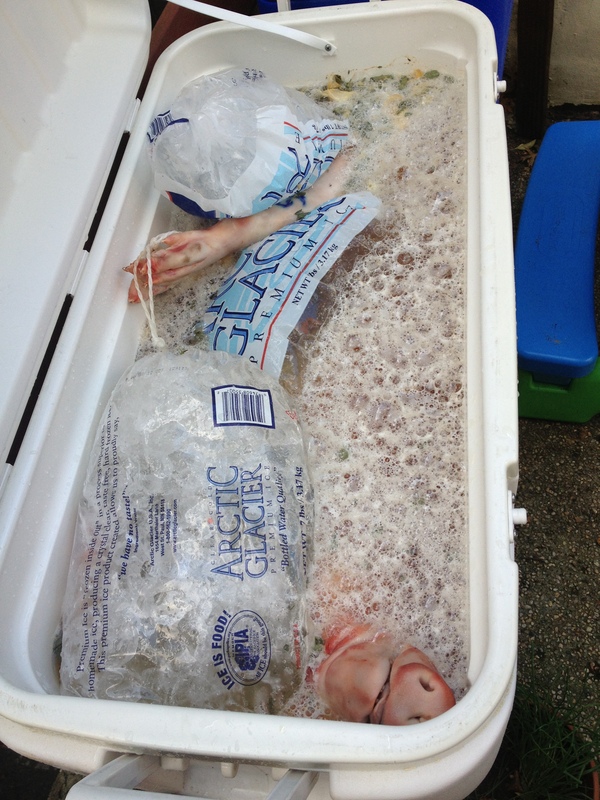 With the brine made and the pig submerged, all I needed to do was keep it cool. I had 5-6 bags of ice still sealed, floating around in the cooler. I made sure to check them every 12 or so hours to make sure there was no melting. Then I put the cooler in the yard, made sure there was always a bunch of weight on top of it, so nothing could get in (bears, squirrels, nosey neighbors, etc.). Forty-eight hours later, the pig was in the roaster ready to go. My only note for next year is to wipe the brine off of the skin of the pig before roasting. It got a bit charred and I think it’s because of the sugar content on the brine. Next year, I’ll wash down the skin with water and make sure it’s completely dry before the pig takes the long trip to the roasting box. Thanks for the tip! Happy New Year. I’m about to pick up a 40 pounder now and brine it for tomorrow’s roast. 40 pounder. Thanks Phil… We do the above brine every year for our fall pig roast, and it always amazes me how great it turns out. Let me know how yours tastes! I’m roasting my first pig Saturday. It’s going to be 37-43#. What are the inside dimensions of the cooler you used for your 50# pig? My pig is currently soaking in a brine… But I’m finding it hard to regulate exactly how cold it is… I keep adding bags of ice to it, but sometimes by morning all the ice has melted. The brine is still very cold and so I just add more bags of ice to it… Is this ok? Or should I be concerned? As long as your pig is not over 40 degrees F for more than an hour, you’re fine. Good luck! I have a 30 lb’er brining, temp has been 25 to 35 here, not much ice necessary! I’m planning on roasting this baby in my outdoor wood oven, thinking it will take about 3hrs. Any suggestions? Sounds awesome. My only advice is low and slow and then crank up the temp at the end to crisp up the skin. Now I need to go so I can build myself an outdoor wood oven. Jealous. Got fresh killed pig from local farmer for Christmas roast. Going to brine them using your technique. I have brined before with chicken and corned beef. Huge fan of brining!!! My girlfriend is from Venezuela and it is the tradition to cook ¨pernil¨ (or pork shoulder) for xmas. She says it always comes out dry (kind of like Thanksgivin Turkey). I am doing two shoulders/legs weighing 17 kilos (weighing 37lbs). In your experience, besides adding flavor, will this retain moisture for a long roast of a piggie legs this size?? Absolutely! Certain cuts of pork are really lean and tend to dry out. I find that brining not only adds flavor, but helps to keep the finished product moist. Something that always helps in moisture is to let your pork rest before you carve it. For a roast, I usually take the meat out 7-10 degrees before your desired temperature (mine is 140F) and wait 20-30 minutes before carving. This allows residual heat to finish off the roast, and lets the juices settle back in to the meat before carving. Good luck and Merry Christmas! Come back to this thread and post a pic if you get a chance!